Vandalia by Del Webb is a new 55+ community in Plainfield, IN. Vandalia by Del Webb will consist of 475 active adult homes upon completion. Vandalia will be Del Webb's second active adult community in the Indianapolis area, building on the success of Britton Falls located in Fishers, IN. Del Webb is known for their sterling amenities and Vandalia will continue that trend. 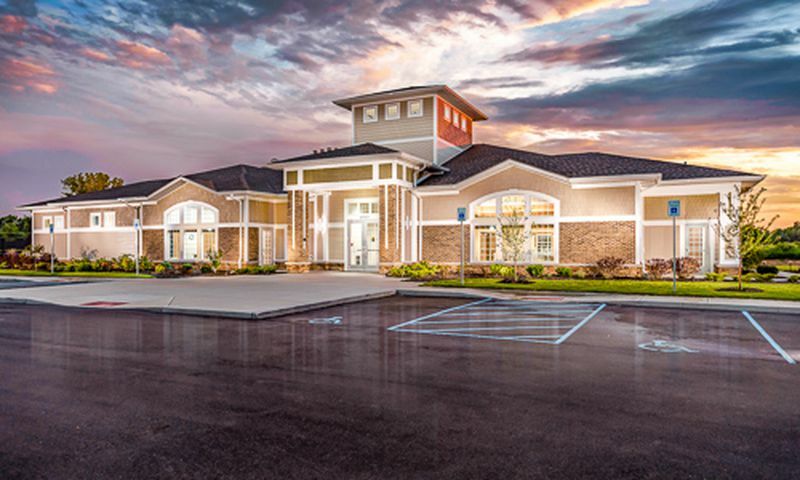 A 7,000 square-foot clubhouse is available exclusively for Vandalia by Del Webb residents. Indoors, the community features a fitness center, large gathering room with fireplace, multi-purpose room for larger programs, and an arts and crafts room, making it easy to pick up a new hobby or attend a community get together. Residents will also have plenty of opportunities for enjoying the warmer months with an outdoor pool, patio, walking trails offering beautiful views of the neighborhood, and access to the Vandalia Rail Trail. Vandalia also offers two tennis and four pickleball courts, as well as four bocce ball courts. Scenic ponds dot the landscape, making Vandalia a beautiful place to call home. Vandalia offers two different home series for active adult homebuyers. The Monterey Series offers five floor plans. These homes range in size from 1,222 to 1,498 square feet and offer one to three bedrooms, one-and-a-half to three-and-a-half bathrooms, and an attached two or two-and-a-half car garage. The Monterey Series boasts optional sunrooms, outdoor living spaces, indoor cafes, and walk-in closets. The Sonoma Series offers four home designs. These options range from 1,683 to 1,953 square feet and offer two or three bedrooms, two or three bathrooms, and an attached two or two-and-a-half car garage. The Sonoma Series offers homebuyers curved multi-level countertops, flex rooms, walk-in pantries, and kitchen islands. Residents of Vandalia by Del Webb will have a full-time activities director who continuously plans fun events for neighbors to get to know each other. There is a constant list of events to attend including men's lunch group and the travel club, while homeowners can stay in shape with Jazzercise, water aerobics, Tai Chi, and yoga. Neighbors can also join together for euchre, bridge, and cardmaking. Pick up a new hobby with oil painting, quilting, and sewing. No matter how you like to stay active, Vandalia will have something for you. Vandalia by Del Webb is located in Plainfield, Indiana, off of U.S. Route 40 approximately 20 miles southwest of Indianapolis. Vandalia is conveniently located just a few minutes from the Indianapolis International Airport, a Walmart SuperCenter, and several other shopping centers for everyday conveniences. Vandalia will also be near Hendricks Regional Health and five golf courses, including the Oak Tree Golf Course that is next door. Vandalia by Del Webb is a terrific new active adult community near Indianapolis, Indiana. There are plenty of activities available in Vandalia by Del Webb. Here is a sample of some of the clubs, activities and classes offered here. The Monterey Series offers five floor plans. These homes range in size from 1,222 to 1,498 square feet and offer one to three bedrooms, one-and-a-half to three-and-a-half bathrooms, and an attached two or two-and-a-half car garage. The Monterey Series boasts optional sunrooms, outdoor living spaces, indoor cafes, and walk-in closets. The Sonoma Series offers four home models. These options range in size from 1,683 to 1,953 square feet and offer two or three bedrooms, two or three bathrooms, and an attached two or two-and-a-half car garage. The Sonoma Series offers homebuyers curved multi-level countertops, flex rooms, walk-in pantries, and kitchen islands. I would highly recommend Gina to anyone relocating to the Plainfield area. She was very knowledgeable about the surrounding communities and the many amenities in the Town of Plainfield. When we decided to purchase our home in the Del Webb Vandalia development, Gina was extremely helpful in all aspects of the purchase, selection and the coordinating of the exterior and interior finishes of our new home. Since we were moving from an out of state location, Gina and Anthony were instrumental in providing support in all phases of the construction process. They kept us updated with weekly pictures and suggestions during the construction phase. We were happy to have them on our team. 55places.com is not affiliated with the developer(s) or homeowners association of Vandalia by Del Webb. The information you submit is distributed to a 55places.com Partner Agent, who is a licensed real estate agent. The information regarding Vandalia by Del Webb has not been verified or approved by the developer or homeowners association. Please verify all information prior to purchasing. 55places.com is not responsible for any errors regarding the information displayed on this website.